Dedicated to Canadian singer/songwriter Matthew Good. 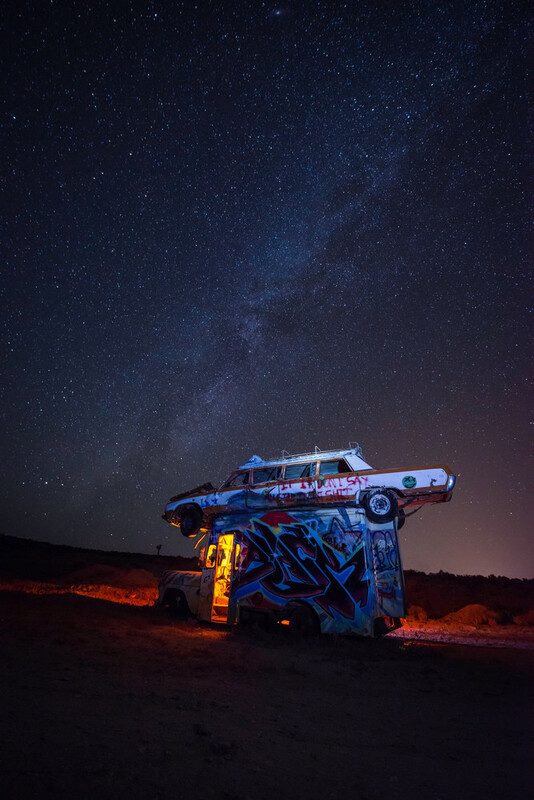 Light painted photograph of a half buried delivery van with an ambulance on top at the International Car Forest of the Last Church, found in Goldfield Nevada. All additional colors were added during a long single exposure. These light painted images are created in camera. Meaning that during a very long exposure, usually between 3-4 minutes I walk into the shot and pop or paint flashes of colored light in various directions using different lighting mediums. From an off-camera flash to a small keychain LED flashlight. These all have varying effects. Using scraps of colored plastic gels (once used in theatre and concerts), over top of the light source to add the color there is very minimal adjustments done in post processing. This creation process is both time consuming and fun as one gets to experiment to get the desired result.